Two men cut off from the world in different ways become unlikely friends and protectors in this offbeat action drama. Danny (Jet Li) is a physically powerful but emotionally stunted man; never given any sort of proper education, Danny has learned little in his lifetime but how to fight, and his minder, Bart (Bob Hoskins), treats him more like a guard dog than anything else, using him in illegal no-holds-barred brawls that earn Bart plenty of money but only reinforce Danny's violent alienation. When Bart is injured in an auto accident, Danny is left to fend for himself, and stumbles upon Sam (Morgan Freeman), an elderly piano tuner who has lost his sight. Sam is the first person to treat Danny with kindness, and the music he plays soothes the troubled soul of the fighter. However, Danny's fighting skills soon come in handy when Sam runs afoul of a pack of small-time crooks who believe he knows too much about their operations. Q: What is the name of the song that Victoria teaches Danny to play on the piano? Q: What is the name of song played during the fight in pool, before to the song "the dog obeys"?? 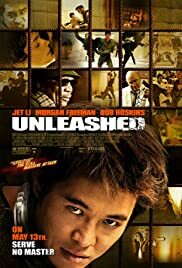 So in the last few years we have seen Jet Li in Romeo must die and Cradle to the grave, both modern and with Jet Li approaching the subject of acting, though hardly touching it. So far Jet Li has not acted he has merely been that kung fu guy, another Bruce Lee. But here, we see him act, not for just five minutes when there is a break in the fighting, but for the entire film. At times there is over half an hour between any kind of fighting, and it is very much appreciated. We really see a different side of Jet Li, this is not 'you killed my master; I have come to avenge him'. But a new, modern martial arts film, where we have a plot we can believe in. Bob Hoskins takes a nice dramatic turn here, 'that man sure can talk', as Danny's 'owner' and it's a gangster role that suits him well. His angry growl is both fearsome and less put on but unleashed. But don't get me wrong here; this is still a martial arts film. You'll find yourself cringing and laughing from fright at the fight scenes. Jet Li is not a sleek, showy performer here, but real fighter, intense and scary in his brutality. But equally brutal is the realisation of human freedom and human nature, in some ways were all somebody's dog. Danny the Dog is clearly Jet Li's best work, and hopefully marks a new direction for him, one I am very much looking forward to seeing. 77 of 84 people found this review helpful. Was this review helpful to you?